Check Out the February Oak Leaflet! Be sure to check out this month's issue of The Oak Leaflet...available online now! 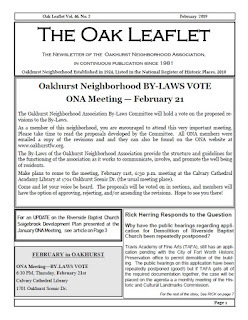 Learn about the upcoming vote on ONA's bylaws, more info on the potential redevelopment of the Riverside Baptist Church property, the latest update on traffic signage at Daisy and Sylvania, and more.